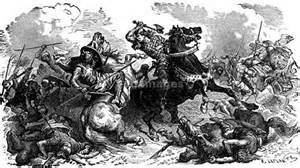 Battle of Tours (732) - Also known as the Battle of Poitiers (because it was fought between the towns of Tours and Poitiers), it was a pivotal conflict in the history of Western Civilization. An army of the Umayyad Caliphate had crossed the Straight of Gilbraltar and conquered most of Spain over the previous 20 years. Its first incursion into Gaul came in 721, but it was beaten back by an army under the command of Odo the Great, Duke of Aquitaine, at the Battle of Toulouse. However, that was a relatively small expeditionary force sent to test local defenses. A mighty Umayyad army returned in 732, and this time meant business. Leading it was Abdul Rahman Al Ghafiqi, a very able and determined military leader, who had not been present in 721. He crossed the Pyrenees and entered southern Gaul. This region was split between the Kingdom of Aquitaine to the west and the Frankish Kingdom to the east. Once again Odo tried to expel the Moors with his own army; but he was badly beaten at Bordeaux, and then again are Garonne. Now, for the time being, southern Gaul was under Umayyad control. To the north, in the heart of Gaul, the Franks waited. Had the Franks been conquered, Rahman may well have gone on to take all of Europe. The Franks were essentially Europe's last line of defense. At the head of the Frankish army stood Charles Martel (whose name means "The Hammer"), who matched Rahman's prowess and determination. But his military was at a deficit, for it lacked cavalry, and he knew he had to fight the Moors on a favorable battlefield. The precise location of the fight is not known, but the sources indicate it was fought on a heavily wooded slope with the Franks occupying the high ground. They had arrived first and waited. When the Moors showed up, they were caught off-guard, not expecting such a large force dug-in on the hill above. Martel achieved his first goal of seizing the battlefield advantage. Rahman, being a shrewd commander, waited for an entire week for the full force of his military to gather, which it did. But time was not on his side. It was October and the weather was turning against him. The records vary on the size of the two armies, with the Arab sources giving a distinct advantage to the Franks, while the Latin sources put them at roughly equal size. It's accepted that both sides had anywhere from 20,000 up to 80,000 troops. 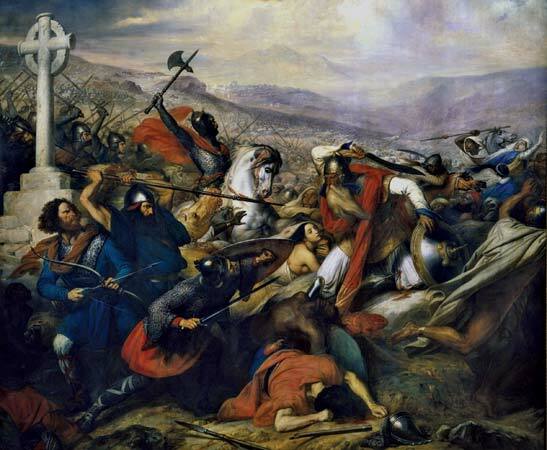 Finally on the seventh day, Rahman ordered attack, expecting his cavalry to break the Frankish phalanx. But Martel had too many advantages. Occupying the high ground, Rahman's cavalry had to charge uphill. The core of Martel's army consisted of hardened veterans who had fought for him for more than a decade. They were entrenched and unfazed by the charge of heavy cavalry. The first day of battle was indecisive. On the second day, the Umayyads made a desperate attempt to break through the Frankish line in hopes of reaching Martel and killing him. But once again, the line held. Martel, on the other hand, launched a subversive attack on the Moors. While his line was holding off Rahman's cavalry, a company of his soldiers snuck behind enemy lines and raided the Umayyad camp. They looted treasure and released their slaves and prisoners causing chaos. Some of the Moorish cavalry broke from the battle to defend the camp. But the rest of their army mistook this as a retreat and began to retreat themselves. Rahman tried to head it off, but in the midst of the confusion, he was surrounded by the enemy and killed. The Frankish army did not pursue the retreating Moors as they did not want to give up their tactical advantage on top of the hill. On the third day, they braced for another attack, but none came. Martel sent scouts to the enemy camp and discovered that they had retreated in the middle of the night and eventually withdrew all the way back to Hispania. The Battle of Tours is one of the very few examples in Medieval warfare where an army of infantry soldiers emerged victorious over an army of heavy cavalry.